You’ve probably heard of it, seen it, or have experienced it first-hand: a sugar ant infestation. One moment, your house is as cozy and status quo; the next, it’s overcome with a colony of sugar-craving, moisture-seeking ants. Yuck! So, what do you do? First, know this: this is a common issue in your neck of the woods. Secondly, we at Aspen Pest Control have a variety of solutions for getting you home and your life ant-free. Sugar ants: What are they? Depending on where you grew up, sugar ants go by many regional names: small ant, coconut ant, stink ant, and odorous house ant, just to name a few. As we mentioned earlier, this is a species of ant whose primary source of energy is, you guessed it, sugar. They have extremely sensitive receptors in their antennae, and are exceptionally good at finding the sweet glucose they crave, whether it’s outside — or inside — the home. Adding to that, they’re remarkably tough. Missing or damaged legs won’t prevent them from seeking out sugar. Even queen ants can still lay eggs even if they’ve experienced extreme physical trauma. What’s more is sugar ant colonies tend to extend over entire neighborhoods in the Pacific Northwest.. The odorous house ant — the technical name for the sugar ant in our area — is one of only a small handful of ant species that can survive the construction processes in new residential and commercial areas. Their ability to adapt to and survive in almost any environment in the NW makes them especially widespread and difficult for homeowners to eradicate on their own. Even if homeowners manage to eliminate the ant colonies inside the home, nature will usually “fill the void” as new sugar ant satellite colonies begin to move in. There’s a reason sugar ant infestations are so common: soil, structure, and landscaping is all a resourceful colony needs to set up camp and start spreading. Outside homes, sugar ants tend to feed on honeydew which is a sugary substance secreted as a sap from insects like aphids. In a home containing all sorts or sugars and sources of moisture within close proximity, their next natural step is to move right in! Add a few of the right type of vulnerabilities or entry ways in your home, and suddenly you’ve got some unexpected houseguests — and a lot of them, with more on the way. How are sugar ants getting inside the home? The most common culprits for entry into the home are houseplants, poorly sealed windows or doors, small holes where utilities enter the home, foundational and other tiny cracks. And once they’ve gained access to a home, they can easily become long term guests (In fact, they’ll start laying more eggs, especially when they’re able to find areas that are dark, humid and moist. Bathrooms and kitchens are the most common locations because of the moisture that is accessed by sugar ants behind walls and under floors in these locations. Of course, many people assume that sugar ants will cause property damage. Since they’re not wood-eaters, like termites or wood destroyers like carpenter ants, this is one important area you needn’t be concerned with. Similarly, for those worried about personal safety, sugar ants rarely bite. Sugar is the one thing they crave, and, that aside, they’re physically different than those ants that do cause people harm, like fire ants or pharaoh ants. Only in rare instances where someone is highly allergic to sugar ants would they be of concern. So how do I prevent a sugar ant infestation? Empty your garbage cans — If your trash contains food waste, we recommend emptying them regularly, even on a daily basis if your home is particularly prone to an infestation. Keep your countertops clean — Tabletops, countertops, and above and below dining surfaces all accumulate crumbs and spills. These are ripe breeding grounds for sugar ants. The cleaner these areas are kept, the lower the likelihood of infestation. Keep your dishwasher clean — In other words, when you’ve filled your dishwasher with dirty dishes, don’t wait! This area screams sugar and moisture, so wash your dishes and empty your dishwasher regularly. Maintain your lawn — Avoiding vegetation overgrowth will help reduce ant infestation risk. We recommend reducing vegetation within at least one foot from the home. Avoid repellents — It seems counter-intuitive, but many of the hardware store variety repellents actually drive ants in the home. Avoid those over the counter sprays to prevent an even larger problem. Get rid of standing water! — Wet ground, standing water, and the like are incredibly attractive to sugar ants. Try to keep these areas clean and free of water so ants are less attracted to gathering there. How do I get rid of sugar ants? To be honest, there are a variety of ways to treat sugar ant infestations yourself, and they typically fall into two categories: 1) baiting, and 2) quick-kill treatments. If you choose to go this route, please — and we can’t stress this enough — please take the proper safety precautions. IMPORTANT NOTE ON SAFETY: Spray ant killers, baits, and other store-bought treatments can be dangerous. These products contain poison, and their ingredients may be harmful to pets and children. Always read and follow any instructions included with these products should you choose to use them. Our personal opinion which is based on thousands of customer interactions is that ant bait is the most effective DIY treatment. Quick-kill sprays sorta work, but they’re only designed to kill the ants you can see, meaning they don’t attack the colony, which is really the root of your sugar ant infestation problem. Another big negative with quick-kill sprays is that they’ll fragment a colony, which can then turn into several colonies. Not what you want, obviously. That’s why we like bait. The ants take it back to the colony, killing the problem at the root. That said, these DIY solutions are “over the counter,” and simply aren’t as strong or as effective as professional-grade solutions. 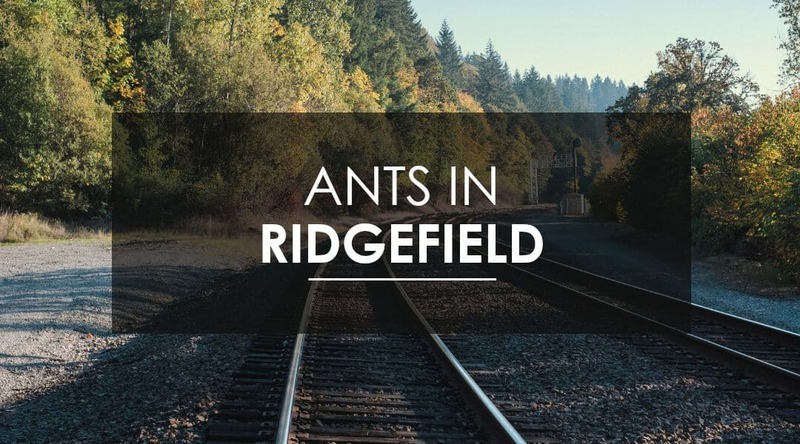 Who can I call for Ridgefield ant extermination? So what do we really recommend to get rid of sugar ants? Call a professional. At Aspen Pest Control, our technicians are adept at treating sugar ant infestations in Ridgefield, and will offer you solutions for your immediate sugar ant infestation problems, as well as long-term treatment solutions to keep your home ant- and worry-free for a long, long time. At Aspen, we use specialized treatments that are designed specifically for eradicating the colony at its source. We’ve helped thousands in the Ridgefield and greater Vancouver area rest easier knowing their infestation issues are a thing of the past. We’re so confident in our approach, that we proudly offer homeowners a free re-service guarantee, meaning if your sugar ant problem comes back, we’ll come back, too — absolutely free of charge. We loves serving the Ridgefield community, including commercial and residential properties. We offer free, no pressure estimates and same day service for no extra charge. Our results are 100% guaranteed and we use EPA approved products that are safe for your family and pets. Contact us discover why your neighbors in Ridgefield are loyal customers of Aspen Pest Control.